I decided to cheat and I did a cut and sew neckline. I know how to divide for the neckline and it is so time consuming on the passap doing double bed. I was glad that I did it. I originally wanted to make a different neckline . I made two separate scarves, hooked them into the shoulder seams and then crossed them and took the ends back to the shoulder seam. Sound confusing…..it was to look like a chain. Well, it did not look good. I just ended up doing a knitted plain neckband like her sweater. I put it on and it did not look good on me. hahahaha . So I knitted up a scarf and it changed the whole look . I like her sweater since the design is larger. Mine came out smaller because I used the dress yarn by Tamm called Estillo at a tension of 3./3. and one strand of each. I love the weight of the sweater. I knitted a tension swatch and when I was drawing up the pattern, it came out perfectly centered so that the side seams match. The shoulder seams matched perfectly also. I had 172 stitches for my width. When I entered my design I added one blank column on each end. When it knits up, you have a solid color edge on the side seams and it makes sewing up a breeze. My width of the sweater was 21.5, waist to hem-15 inches, neckline depth-3.5, sleeve is a 6 inch cap and 16 inches from wrist to underarm. Total sleeve length is 22. 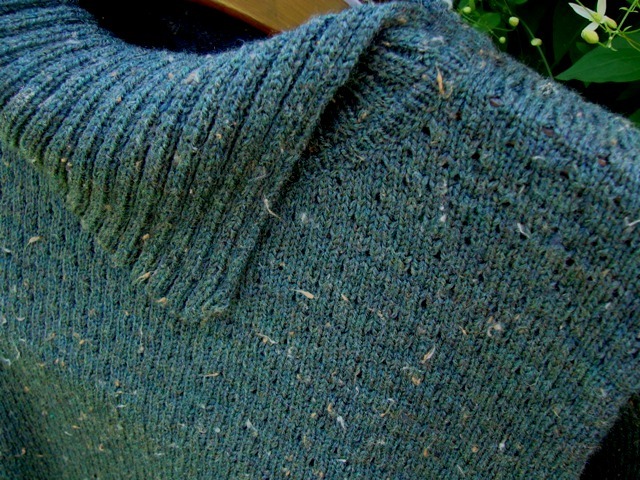 I had a 9.5 armhole opening but knitted the sleeve to a width of 18 to eliminate the bulk under the arm. 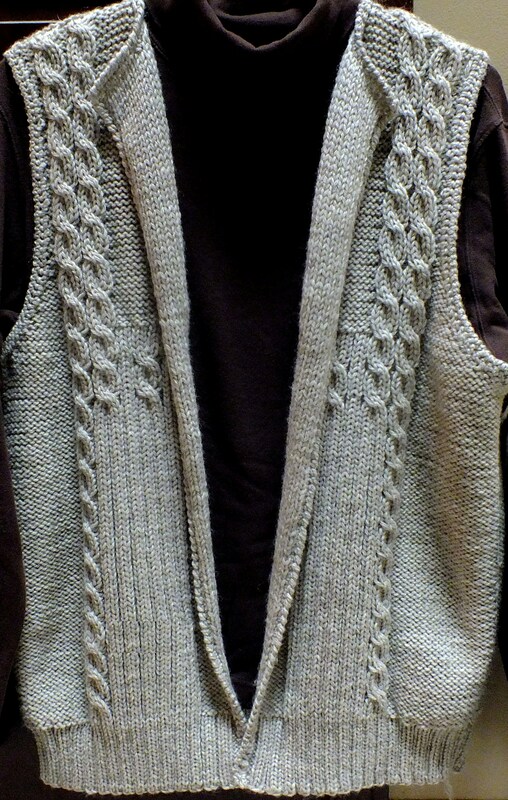 I just finished knitting this sweater following a pattern called China Pattern Jacket . It is in Modern Machine Knitting magazine dated June of 1992 . I made this on the Passap E6000 and made lots of modifications. I made it a sweater instead of a jacket. I used win/crea to change the patterns of the leaves so that they were not split in the front like the original pattern. I also spaced them so that they were not in the seams of the sweater and the sleeves. I patterned the neckband so that the design did not go into the buttonhole. There is only one buttonhole in the band at the neck. The yarn I used was Diamonte in Wedgwood Blue and Cream. Now I am going to tell you that I absolutely love my E6000 BUT ….now I don’t feel like a traitor to Brother machines. This would have been a breeze on the Brother. The only reason I used the Passap was to try fair isle and I won’t do it again. 🙂 EVER! It is very confusing doing patterns since you have four rows to knit for one row. I also had to keep raising pushers on the ends when I knitted the second color. (like the end needle selection that Brother has). Wrapping was out of the question . And FLOATS? OMG they are huge. I had to latch tool up behind the flowers to pull the floats in so that there were no gaps between the background and the pattern. I don’t see how that can be avoided using any machine with this pattern though. Well, unless it was knitted in double jacquard. I sort of like the jacket better but short items don’t look good on me. I do have to say that this is one of the best fitting sweaters I have ever made and it feels good on me. The sleeves are my perfect length also. So if a Passap is the only machine you have, this can be done. Now I have to do the sleeves but I don’t want to do increases in the ribbing part because you knit circular , then transfer to a 2 by 2 rib and then knit circular again . My cuff came out to 3 inches so I subtracted that length from the arm length and ended up doing more increases in a shorter distance to get the right width at the underarm. I finish that and join the sleeves. While knitting the sleeves I thought that for the front band I would use the same design I used for the bottom and cuffs but instead of doing the last circular rows, I did the “sandwhich ” join and it ended up being really easy to do. While doing the bands, I didn’t want to bring the band down to the bottom five inches because I wanted to leave that open . I just wanted three buttons . So I left the rib edges unfinished . I did latch tool crochet through the first and second stitch to give it a little more thickness. I wanted something casual and this ended up being a little more dressy but at least the sweater was not a loss. I did have something funny happen. 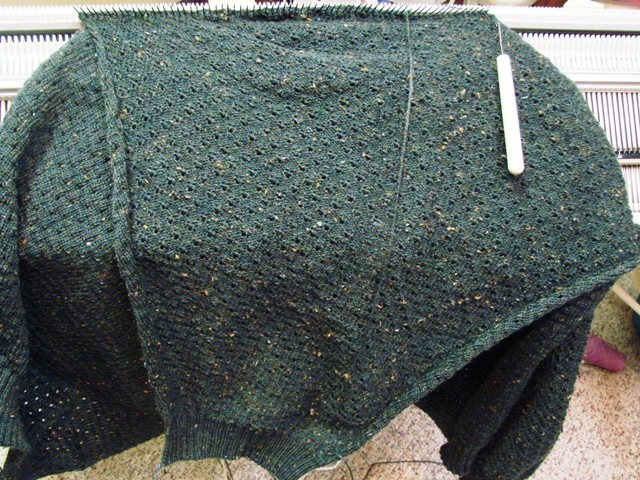 It is so hard to tell how the length of the sleeves will feel until the sweater is sewn together. So I did the bands and sewed the side seams and OMG, the arms were down to the floor….well….not to the floor but they were a good inch too long. I left my sewing room and contemplated a remedy. 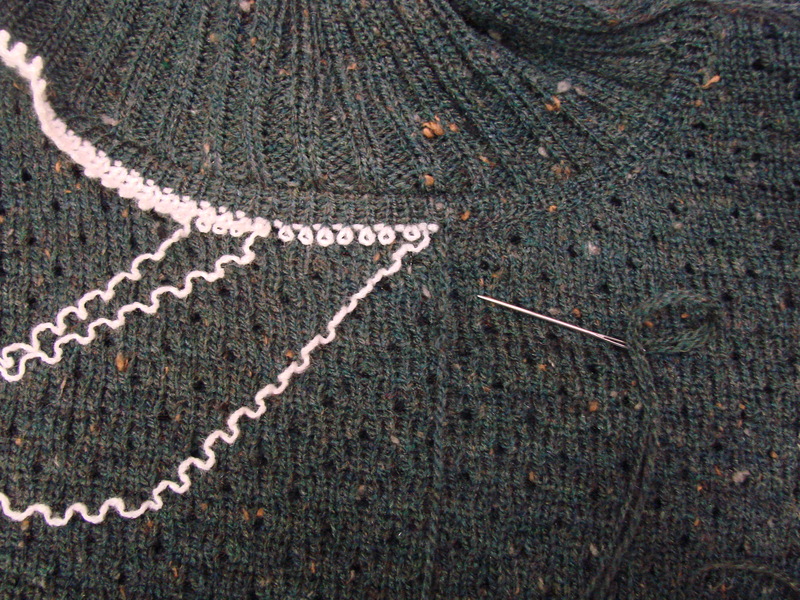 It is not a big deal to shorten the sleeve but I did not know how I was going to join the cuff. I did not want to attach the rib and then bind off. Okay, it hit me that I could do the cuff like the front bands. I had some things to do and put this on hold. Then I got the idea to leave the seams open and wash and dry it like my swatch. I did that and the arms came out perfect length! SO, it does pay to do swatches. I am so glad I did not shorten and then end up having 3/4 sleeves. I needed a simple one stitch buttonhole and my next post will show what I did. I found the directions in a ribber book but the explanation made no sense until I tried it. I wanted to use small buttons and this was perfect for it. I tried the square neckline in my last posting because I wanted to make a square necked tunic. I used Bramwell’s Duo Magic in olive green and wood pigeon! What color is that you ask? It is like a beige color. I used pattern 1289 (8 stitches by 8 rows)in the passap pattern book and technique 183. After I figured the number of stitches I needed I realized it was the perfect amount for the sides to match….a first for me. 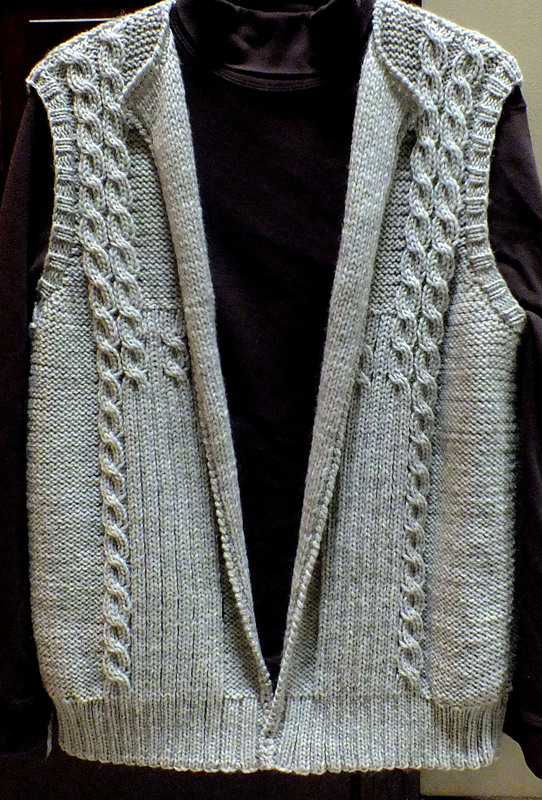 I did the neck ribbing after I finished the front . I sort of thought it looked plain and matronly but I continued to knit the back . I figured out how to knit the back with a one inch drop without doing a cut and sew. Then I knit the back rib . Here is what I learned while knitting this. To take stitches off on waste yarn on a brother is easy .You just pull out the needles to hold that you don’t want to knit. I had to figure out how to do this to remove the left side stitches of the front to work on the right side. I figured out how to do this on the passap and laughed when I succeeded. I used pushers under the front needles I wanted to remove and LX setting on front lock and GX on back lock. On the back I brought in pushers and used BX and GX on the front lock.. I took off circular and it made it easier to rehang the stitches to do the left front shaping. The next thing I learned is that when your increases or decreases are in every row if you don’t put the end pushers up on the front bed, the end needles will start to have stitches pile up . That is because you knit four rows for one row and the second color did not always knit the end stitches because of the pattern.I experienced this on the sleeve cap. The third thing I did was when I knitted the sleeves, I started with 60 stitches and got to 120 at the underarm. When setting up the pattern I set the Left and Right stitches at 35- and 35+. This way, when I was knitting I did not have to take the locks all the way out to needle 60 so the console would not beep and make me reset the pattern. I kept doing this as I increased in increments of five. I never forgot once. What also surprised me is that I never forgot to put a pusher in work or out of work. When I first knitted on the passap , I always forgot since you don’t have to worry about that on a brother machine. I am now happy with the sweater and especially with the weight of it. I love Bramwell yarns and I am glad I made this sweater instead of an afghan. AND I still have 8 ounces of yarn left on each cone! I really like square necklines but have never done one….go figure! It has been so hot and humid and I have been trapped inside so I started looking through books that I have. 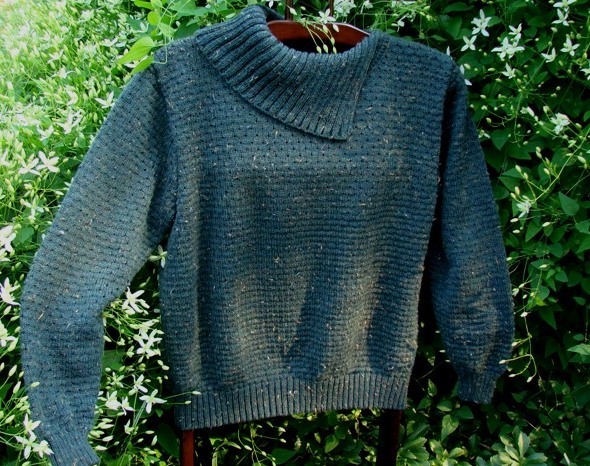 I came across the instructions for a mitered band for a square neckline knitted on the passap in the book Going Places Knitting Technique Passap, designs by Jan Wold and Jan Mills. I really like how it turned out. It is a lot of moving the needles down the right and left side of each corner after you decrease at the corner but I would definitely do one on the machine. My girlfriend Sheila could probably knit it faster than it takes me to do it on the machine.No, not probably, she could! One thing I don’t get is, after you move all the stitches down( and it is done twice over four rows of the decrease) she tells you to take the end most stitch on the bed and transfer it to the other bed and then take the heel of the stitch next to the needle you just emptied and move it to the right(or left) to keep in a one by one sequence. What is happening is that you are actually decreasing two stitches at the corner and then move all the work over and increase one stitch on each end. I get that but if you look at the edge at the shoulder, it curves up and I would not include that curve when I sew the rib together from the back. Maybe it is there to give and edge to sew. 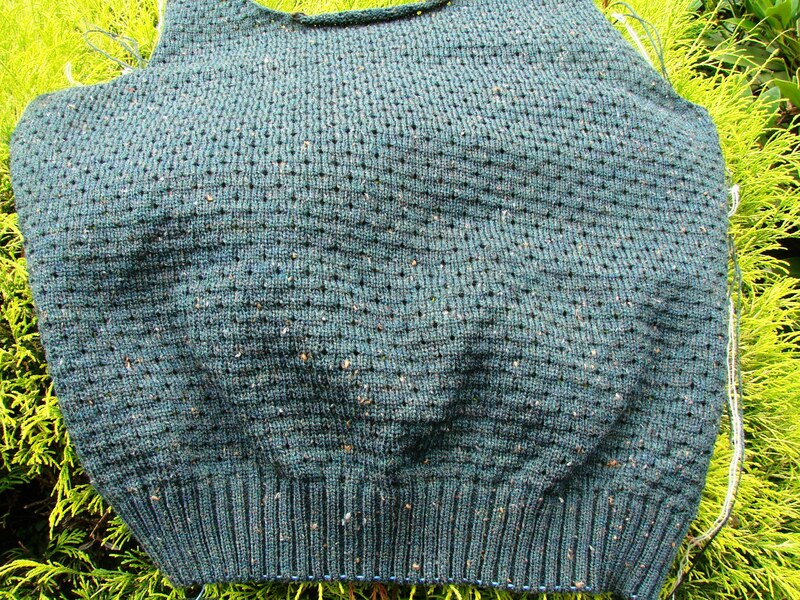 This can be done on all machines with a ribber, but be careful of how you hang the body of the sweater before starting to make sure you are on the right side. 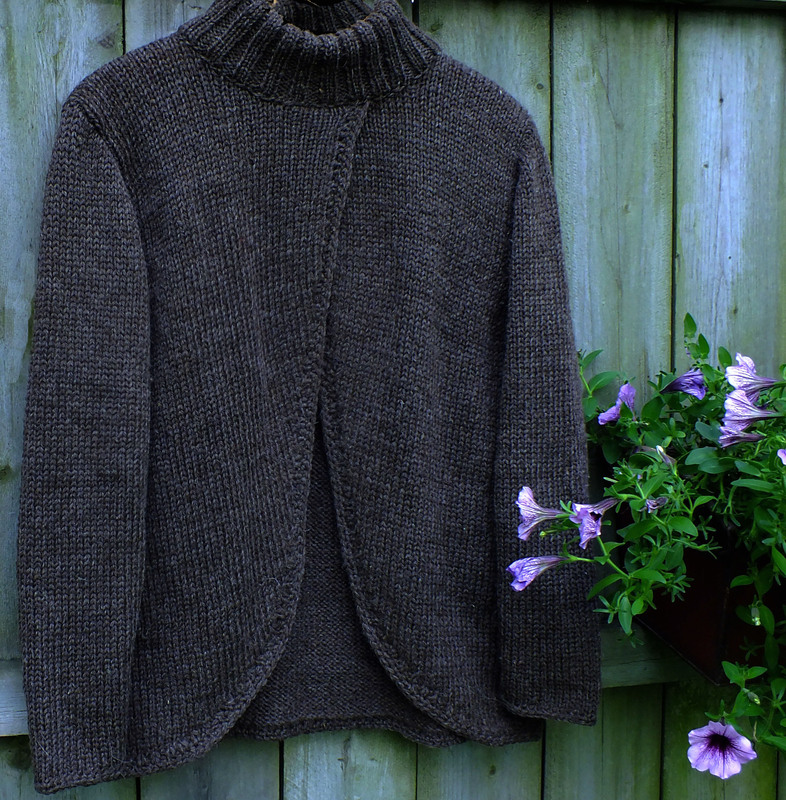 This sample has the main body of the sweater wrong side facing and hung on the back bed to start. I have been doing yard work and enjoying the summer and that is why I have been gone from my blog so long. I made some baby stroller blankets and while winding yarn I saw this free pattern on a stack of books and I thought I would try it. It was a free hand knitted pattern by Moda Dea that I think I picked up at the Joann fabric store. It must have been awhile ago because the yarn it is made out of is discontinued. It was called Gleam. I did a tension swatch and tried to get close to the pattern gauge. This was so fast to knit the fronts, back and the sleeves. I decided to finish around the front and bottom edges the way the pattern said before I went any further. I used wool and sometimes it curls on the edges. Not so with this. I loved how it was done. You pick up stitches along the front, bottom and other front on a size 10 circular 29 inch needle( that I did have! Yay) You knit one row of K1P1. Then you bind it off. Then you take a size J crochet hook (that I did have! Yay) and crochet around the whole edge and then tie off. After I steamed the edges, they lay completely flat and don’t turn. Nice tip for my future sweaters. Now don’t laugh. It took me longer to pick up the stitches and do this edging than it did to knit the fronts and back on the machine! I did re do the sleeve pattern part because it was a little too wide at the underarm. Ordinarily I would use 18 inches at my widest point(for a 9.5 inch opening) before decreasing for the sleeve cap. I reworked it to 17 inches and it came out perfect for me. I don’t know that I like the feel of the wool around my neck but will definitely wear a turtleneck under this. Hope I am not too hot. I may try another one in acrylic yarn. If anyone wants the free pattern from Mod Dea just email me. I started this vest over a month ago. I saw this sweater on my neighbor and told her I thought it was so cute. She gave it to me and I took pictures up close and the measurements of it once I tried it on. The shoulders were too wide so I had to do a set in armhole. I finished the fronts and back. I thought the armholes looked too large for a crocheted edge so I put a ribbed band on . Then I let it sit and when I went to do the other arm band, I had not written tension and stitches. Had to do an armband two times. Then, because I sewed the side seam up I had to attach the second band in two sections. I did not like the way the front edges were curling and hanging so I did a 2 by 1 rib and took it off. Then I did my favorite button band and it looked too formal. I decided to try a single crochet and then a backward single crochet (crab stitch) that I have never done in all of the years I have crocheted. 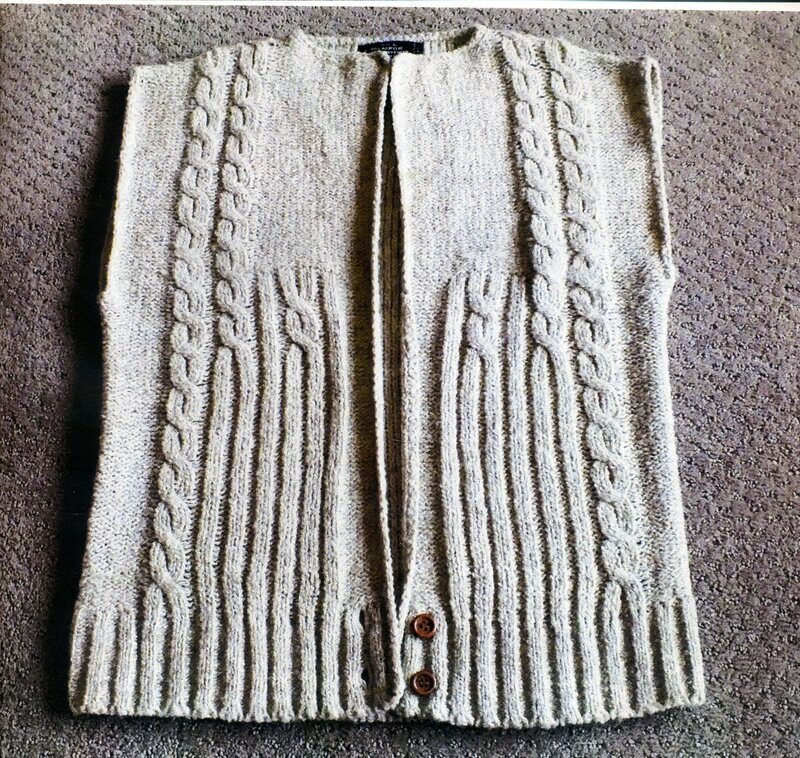 I like it and it did pull the edges up so they were not longer than the rest of the sweater. So, now I try it on and I don’t like the armbands with the rib. They felt too tight and they were off the edge of my shoulder so….. I took off the arm bands and did the single crochet and the crab stitch and I like the outcome. On my neighbors sweater there are two buttons at the bottom and the button holes are done on a machine. I may do that since the buttonholes were in between the ribs. Then again, I might not do any. 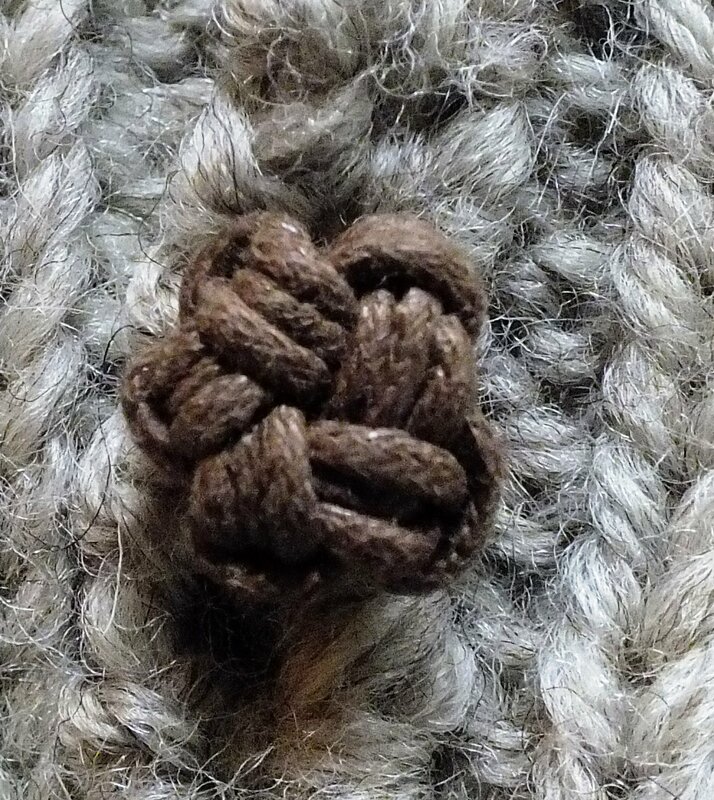 I also made a button called the Star Knot, sort of like the monkey fist button but easier. I used cotton braiding cord. That is in the last picture. If I use buttons, these are what I will use. The second picture shows the vest with the arm bands. The third picture is my neighbor’s sweater with the front edges straight up because I was measuring. I figured my stitch and row gauge and then went to DAK and printed out the picture so I could follow it at the machine. I finished this sweater late last night. It fits me nicely. I used the U100 to transfer stitches from the front bed every four rows. It is pattern 1033 and technique 280. I did set in sleeves since drop shoulder sweaters look terrible on me. I am not that familiar with doing necklines on the passap yet so I did a simple one. I added up the neck stitches I would need. I cast on and did a 2×2 rib for 60 rows starting with tension 7. I changed tension every ten rows and ended up with tension 5.. at row 60. I transferred all front bed stitches to the back and then hung the sweater with the right side facing me and knitted one row by hand. Then I knitted 6 rows at a looser tension like 5 or 6 and took off on waste yarn. Then I folded the edge down and backstitched through the open stitches of the last row of stockinette stitch. I used the “sandwhich” because when the neck folds over, it gives it a nice finished look. I steam the waste yarn and the rows of stockinette of the band so that when I unravel the waste yarn, the stitches don’t go anywhere. This part of hand work I actually enjoy doing. It does not take long at all once you do it several times. This is not a dressy yarn. I used Bramwell 4 ply yarn. I have had this yarn for years . I liked the flecks of color in it . I bought it when I first started to make sweaters. I made simple ones to get the fit right and used the yarn to add a little to the plain sweater. This design however would have shown up better with a plain color. You can see through this so I will wear a tan round neck top under it. It has a nice look with the other color showing through. I also attached the sleeves on the machine. Now……what should I do next! Today I decided to try a transfer lace sweater using the U100. It is a simple pattern and only requires transfer every four rows instead of every two rows. I did a 2×2 rib and it will have set in sleeves and crew neck. Simple. I did not do cut and sew because it is easier for me to do it on the machine and have it come out evenly than to use my sewing machine (that just died after 30 yrs! 😦 The yarn I am using is Bramwell four ply. Of course, after I started this I recieved my order of some Bramwell duo magic in beautiful colors. Oh well, need to use some of the yarn up that I have. If you click on left button of mouse on picture you will see a blue strand of ravel cord at the bottom. I learned this simple technique for pulling stitches together from casting on. After you do your CX rows for circular cast on, lay a thread of waste yarn across the needles between the beds and gently pull down both ends under the machine and knit your N/N row. When you take the cast on comb off, it pulls the edge together nicely. Then remove it.